The northern city of Hai Phong will pilot solar-powered buses on Cat Ba Island in 2017, local officials said. The municipal People’s Committee organised a meeting on February 10 to announce the project, the first of its kind in Vietnam. 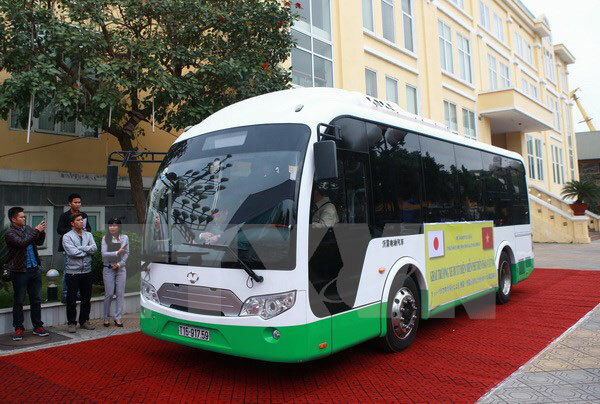 Kengo Ishida, Executive Director of the Asian Center for Low Carbon Society – the Environment Bureau of Kitakyushu City, said the electric bus project is one of the 15 green development projects jointly implemented by Hai Phong and Kitakyushu cities. The bus battery can be charged by both solar power and electricity. It is able to run up to 160km and carry 50 passengers. In 2017, Hai Phong will operate one solar-powered bus with four trips a day on two main roads on Cat Ba Island. The number of the piloted vehicles is set to increase to 10 next year and 30 in 2020. During the trial period, the service will be free. Le Thanh Son, Vice Chairman of the municipal People’s Committee, said the city will create favourable conditions for relevant sides to implement the project as soon as possible. It will expand the use of solar-powered buses if they prove to be effective and suitable for local conditions. Hai Phong is one of the first cities in Vietnam to target an energy-efficiency economy with a view to becoming a green, civilised and modern city in 2020./.